Don’t bother me. Just figure it out. And being a good Samaritan, Excel shows decimal point if there is something after it, else omits it. See the demo aside to understand this. What if your numbers are results of a calculation? It doesn’t matter. General formatting takes good care of the cells. It shows and hides decimal point depending on the result of your formulas. Now you are talking. The General Formatting option shows numbers as typed (or calculated). So 124578395 would look like 124578395 instead of $ 12,45,78,395. So how do you show $1,245 and $1,246.34? Aside: You should always show decimal points if some values have them and others don’t. The below technique is useful when data is a result of calculation. For example: In a dynamic KPI report, for certain KPIs you may want to show decimal points, and omit for others. Select the cell(s) where you want this formatting. Go to Conditional Formatting > New rule from home ribbon. Go to “Number” tab and Apply formatting with 2 decimal places. Click OK & You are done! Now, if the cell has a decimal value, it shows, otherwise the decimal point is omitted. Do you deal with such situations when formatting numbers? Often when making reports (or dashboards), I have a cell where any data can go, based on user selection. In such cases, I use conditional formatting to define how it looks based on the data. Sometimes, I also use TEXT formula to format the data. This is more suitable when data is displayed in a text box rather than a cell. What about you? Do you face situations like this? How often you rely on General formatting? Please share your experience and tips using comments. Understanding how Excel formats numbers (and other values) can save you lots of time when you are designing dashboards, reports or workbooks that need to presented. Check out below articles to get few more tips. How to hide “0” in chart axis labels? How to hide cell’s contents using format codes? I know this may seem to be a simple thing, but whenever I'm working with decimals, I use one of the ROUND formulas (generally ROUND, rather than ROUNDUP or ROUNDDOWN). This lets me have a 'cleanly' rounded number so that if I need to use the results of that calculation anywhere else (such as uploading into another program). I generally pair that with either the accounting or currency formatting, depending on what look I want the cell to have. If I don't want to have the decimals show, I just change the setting for the number of decimal places. The only time I find myself working with general formatting is if I don't know what type of value will go into a cell. Conditional formatting tip is suparb, chandoo !! Re General format.. We can use Ctrl+Shift+` after the enter the numbers either with decimal or without decimal. I disagree, you should always show the same number of decimal places in the same context. User declare 2 decimals----calculation gives 12,2345----I see 12,2300 but I just want to see the decimals that user declared. I need a way to make the number format depending on how many decimals wants the user. Hopefully I made myself clear. Thanks in advance! This is the formula I used. Use the number format of 0.## which will show 1 as 1., 1.234 as 1.23 etc. Biggest issue is whole numbers show the decimal point with nothing after it. I'm need to find out how to remove the decimal but keep the cents. Silly question: have you considered multiplying your number by 100? I appreciate this is a bit old, but there is another solution. 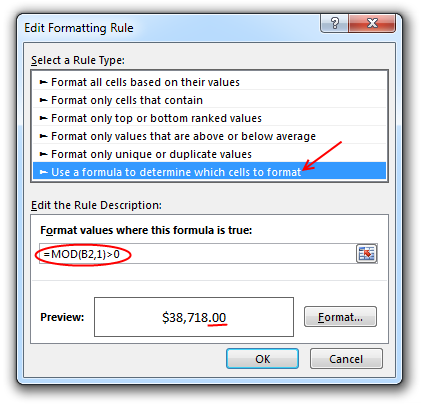 I wanted to be able to format numbers as 0.### "kG"
The benefit with this solution is no conditional formatting and it can be used in pivot tables...etc. But I wanted excel displayed the exact result: 222,9984 instead of rounding it up. my spread sheet use number and dollars. i have to put the decimal point in by hand . over 300 people in the they just say keep the same for it can't be done. well I thought that excel could do anything you could think?? each line on my spread sheet has 5 numbers cells and 4 dollar cells. Thanks your joke made my day. And if it wasn't a joke it's even funnier. The quotient is 123.56 but it shows as 123.00. I need the exact amount. How can I resolve this?